Only 2 days late posting. Could be worse. Are you feeling like I am? Like all those holiday goodies are hanging around a little too long....like around the waist and thighs? It's high time to get back to healthy sensible eating. Well at least for a minute. Because just after this post, I will be posting some yummy almond raspberry and lemon cupcakes. Even more reason to work in lighter and healthier fare. This week's French Fridays with Dorie recipe fit the bill perfectly. Paris Mushroom Soup. It's low in fat (only 2 tablespoons of butter for 6 very generous servings). Mushrooms, onions, garlic, fresh herbs, chicken stock and little white wine. No cream. The soup gets pureed and served over some fresh parsley, green onions and thinly sliced mushrooms. Unfortunately I didn't have any mushrooms to spare for this step, so it's the one thing I left out. Though next time I would make sure to have ample mushrooms because I think it would really take this soup to the next level. The soup was light and tasty, though it wasn't as amazing as I hoped it would be. But it was good enough to keep on the make again list to see if the extra mushrooms do the trick. 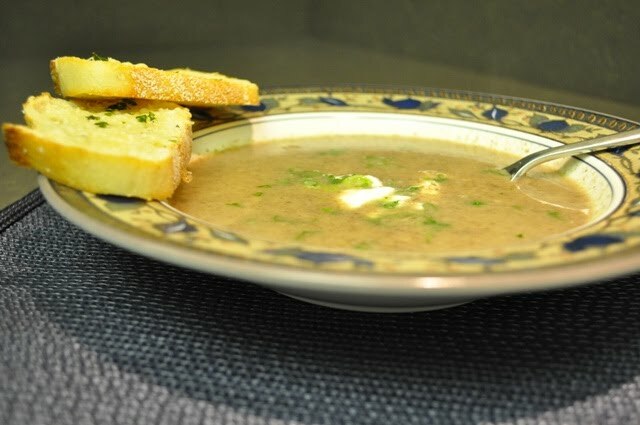 Check out French Fridays with Dorie to see how the Paris Mushroom Soup turned out for the rest of the group. To get the recipe, pick up a copy of Dorie Greenspan's fabulous cookbook Around My French Table. Soup and bread...is there a better dinner option in the winter? :) I'm intrigued by this recipe - I love mushrooms so I'll probably try it at least once before the weather warms up! I really liked the soup with the salad. It added extra flavour and texture. Mmm...I love mushrooms. This looks awesome.